Fly-fishing takes us to some of the most beautiful places on earth, and we don’t always return home from those places empty handed. Deer and elk sheds, not to mention bones or even skulls, abound adjacent to rivers throughout the country, and more often than not you can find a creative way to turn the day’s souvenir into a permanent keepsake. I’ve found sheds from Appalachia to Arkansas, and I’ve dug century-old bison femurs out of old bison jumps on roadbeds in Montana. (One caveat: As tempting as it may be to bring home that six-point elk shed from Yellowstone, it is illegal to remove antlers or skulls from a national park). Tying-tool racks are the perfect way to display a unique shed or bone. And if you can hang a picture, you can make your own attractive tool rack. Moreover, if shed hunting isn’t in your program, you can always buy commercial deer sheds on eBay for little cost. All you need is a measuring device (even a ruler will do), a pencil or pen, and a drill equipped with ¼” and 1⁄8″ wood-boring bits. Be sure to take into account the most stable orientation for your particular shed before you drill, and don’t be afraid to flatten one side with a well-placed cut (a normal circular saw will do the trick) or with some aggressive sanding. Even sheds like the squirrel-gnawed one I found can look perfectly beautiful with a little light pruning. Once you’ve decided on a permanent arrangement (note the “two-story” configuration of the shed pictured), use your pencil and measuring device to mark the hole locations. Be sure to mark—and drill—straight down. One-and-a-half inches is a good spacing distance for holes intended to accept bobbins and other bulky tools, while for smaller tools you can narrow the spacing to an inch apart. Use your drill’s highest speed setting and expect to smell the odor of burnt bone. 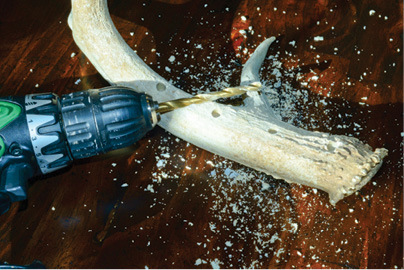 Place the antler on a soft surface—such as an old towel—so it won’t slide, and be sure to drill only on a disposable bench top or spare piece of wood. Start with the 1⁄8″ bit to drill a pilot hole (this will also let you straighten everything out if you accidentally begin at an angle). For most tools, including scissors, bigger bobbins, and forceps or pliers, you will want to follow up with the ¼” bit. Be sure to leave a few strategically-placed 1⁄8″ holes for bodkins, midge bobbins and other fine-pointed tools. If you’re using a bigger piece, like a cow skull or a bison femur, you can even use a paddle bit to drill out 1″ or 2″ slots for bead containers or bottles of head cement. When you’re done, either leave the antler in its natural state or apply a coat of polyurethane spray to seal and shine up your new tool rack. This is a good idea for gift pieces, just in case the recipient is a bit squeamish. For “fresh” pieces, you can always soak the object in a light 1:10 bleach solution for sterilization. Ultimately the only limit on what you create is your own imagination and the flexibility of the piece you choose. This article originally ran in the Summer 2011 issue of Fly Rod & Reel magazine. 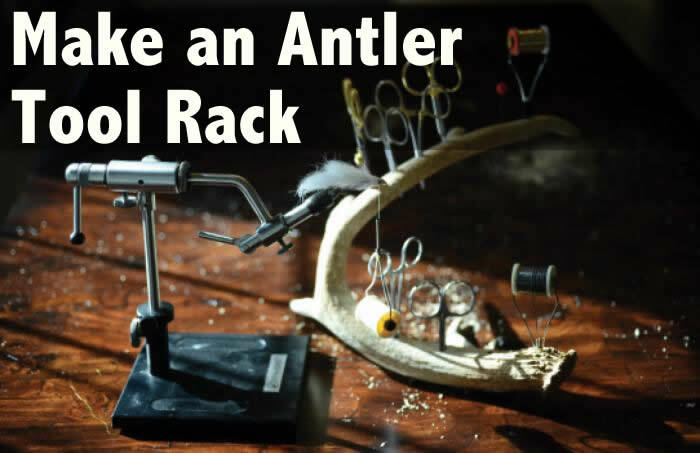 3 Responses to "Make an Antler Tying Tool Rack"
Zach, thanks for showing very simple ways to make an antler tying tool rank. I’m looking forward to give it a try.